L.I: to create a newspaper article about an event or happening that occurred in the previous 7 days. This week for reading, our must do was to create a newspaper. This newspaper needed to inform people about something that has happened or is happening in a one week time span from when it occurred. We had multiple choices on what to make the newspaper about, and I chose to do a weather report. 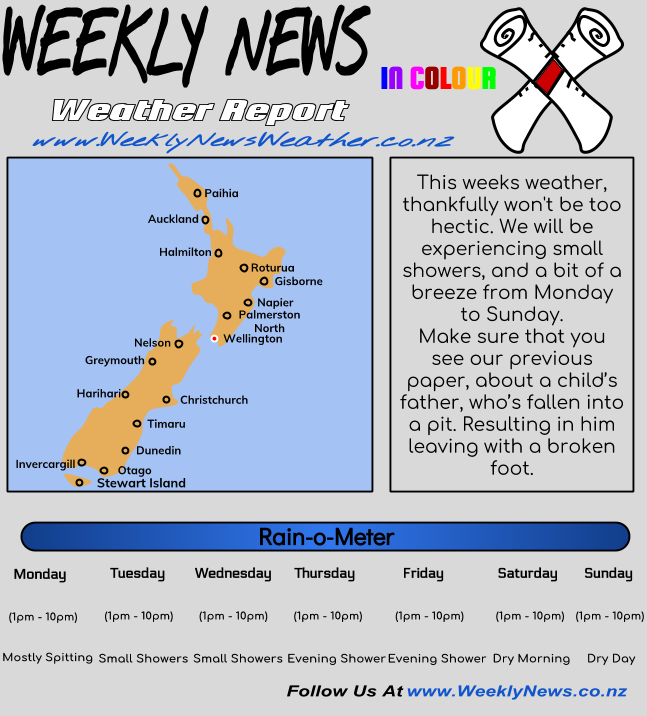 I found multiple sites that let me now about the up coming weather, and I also decided to continue my previous newspaper that I made, which had the title, Weekly News. Now this one was very different from the other one, this time I added in colour, to make the newspaper more lively active, allowing it to engage into peoples attention. In my newspaper, there were 3 parts to it. 1: A picture of New Zealand, bullet pointed in each part. 2: A small description of this weeks weather. 3: Something called a Rain-o-Meter. (The Rain-o-Meter is a simple way of explaining each days weather details). Great job on completing and remaking the weather report, I really like the Rain-o-Meter too! I also like how you created a drawing of New Zealand, I don't know what we look like on a map but I'd say that that's accurate. I have a question though, how long dd this take you to make?